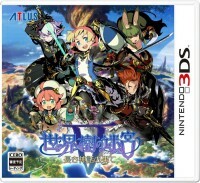 Atlus has been quiet on localization for Etrian Odyssey V, but the game is indeed coming west. A test site spotted on the company’s website reveals a Fall 2017 release in North America with the subtitle “Beyond the Myth”. We also expect Deep Silver to handle publishing in Europe. Atlus should be following up with an official announcement soon. When we have more news from the publisher, we’ll be sure to let you know.